Koneko is a fifteen year old who attends Sei High School. She has light brown curly hair and pale blue eyes. She's completely head-over-heels for Hisakinageru Ryuu... and at some points, it can get out of control. (However, I'm quite glad he's nothing like Kitsune! *grin*) She's sane... (unlike Kasu-chan for selectin' Kitsune... >_<) and we'll just leave it at that. Koneko says this to transform into Sailorhermes. She raises her henshin stick (which is light blue with a blue star on top) and a light blue ribbon circles her body, forming her fuku. Which is opposite colors of Mercury's. This is Sailorhermes' only attack. Blowing a kiss with her gloved hand, bubbles fly into the air, creating a mirage of the worst thoughts of the target. They look so really, it freezes the target with fright. Koneko OR Sailorhermes says this to transform into Super Sailorhermes. Same transformation as before, but with arm shields. This is Super Sailorhermes' only attack. Raising both hands, crystalline rain drops gather around them. They then fly at the target, falling upon them, and freezing them solid. Then cracking and shattering, killing the target. 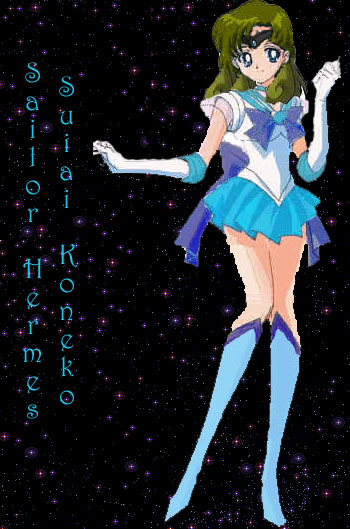 Koneko OR Super Sailorhermes says this to transform into Eternal Sailorhermes. Same transformation as before, but with guarded arm shields and a longer back bow. This is Eternal Sailorhermes' defensive attack. This attack is actually four times as freezing as Crystal Rain Sparkle. This goes slower, and ultimately, it can kill by the slow speed, before they freeze into a block of ice. This is Eternal Sailorhermes' offensive attack. A thin silvery thread pulls from out of nowhere, and it floats all the way to the Senshi (Greek or Sailor) and touching them, they are washed with a refreshing amount of energy. It wipes out the energy of the target.